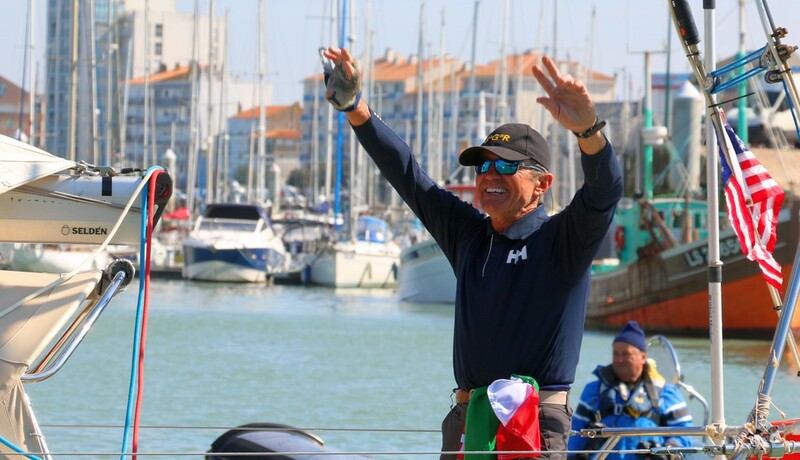 American Hungarian solo yachtsman Istvan Kopar reached the finish line off Les Sables d’Olonne, France at 13:58 UTC Thursday to take 4th place in the 2018 Golden Globe Race. The 66-year old yachtsman from Delray Beach, Florida, who suffered continuing steering problems almost from Day 1, overcame setback after setback throughout the race. The water tanks in his Tradewind 35 yacht Puffin became contaminated soon after he sailed down into the Southern Ocean, and by Cape Horn, the black mould growing inside the boat became so bad that his health began to suffer. And the problems continued right to the end. He happened to arrive back in the Bay of Biscay shortly after the container ship Great American had caught fire and sunk, 180 miles due west of Les Sables d’Olonne, generating large tracks of oil and chemical pollution on the surface being blown onshore. And if that was not enough, Istvan also had to pick his way through a web of ship’s containers floating on or near the surface. On Tuesday, he was down to his last litre of drinking water but dared not process any sea water through his emergency desalinator, fearing the pollution would clog up the unit’s membrane. Kopar said: “It was torture for me. My self steering failed almost from Day 1. The boat itself did not have a problem. It was I who had the problems. Luck was just not with me. I think I’m done with sailing now and will take up gardening instead” he joked. That was today . . . Tomorrow it may be a very different story!